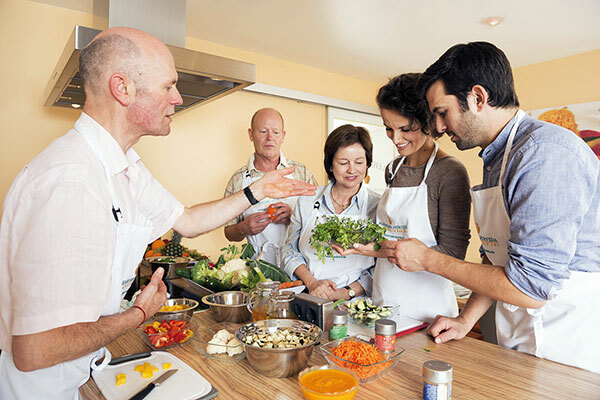 Our Ayurveda cooking classes: Every beginning is easy! What’s so special about Ayurvedic cuisine? How to successfully prepare all those great dishes? Which herbs and spices are used most and what is their influence? How to find the right diet to improve my health and well-being? We’ll answer all your questions in our specially designed teaching kitchen. And, together with our experienced Ayurveda chef Jochen Lotz, you’ll be preparing the main Ayurvedic dishes. You’ll learn and, what is more, experience with all your senses which food is beneficial and can be metabolized completely – so that it’s not just filling, but fully nourishing. This course will give you a perfect start into your own Ayurveda gourmet world!